Composting is the useful process of turning waste products into a rich compost that can be used in the yard or garden as a mulch or fertilizer. The kitchen is a veritable treasure trove of compostable materials. Everyday cooking and food preparation tasks yield an abundance of natural items that can be easily composted. You can keep many of your kitchen scraps out of the garbage or garbage disposal by collecting them for composting. Place a lidded container on your kitchen counter in an inconspicuous place. Clearly label the container so that others will understand what it is for. You can use a discarded plastic food container to collect kitchen scraps, but label it so no one puts it back in the fridge, thinking it's edible food. Collect compostable kitchen scraps as you prepare your meals. 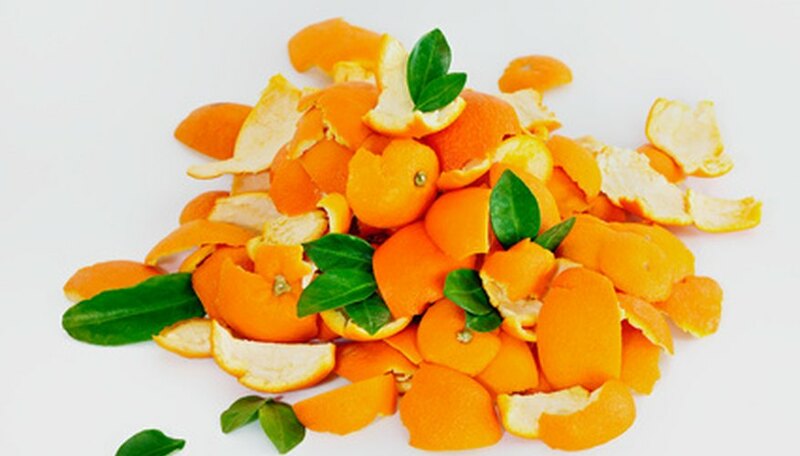 Remains from fruits and vegetables, such as peels, cores, rinds or whole produce items that have begun to rot, are excellent fodder for compost. Eggshells, bread and grain products, tea bags, coffee grounds, coffee filters and napkins can all be added to your compost container as well. Discard meat and dairy products in another way--do not add these to your kitchen scraps for composting. This includes all fish, poultry, meat, cheese and butter. Avoid adding any oily foods to your compost. Empty your kitchen composting container into your compost bin regularly. Add this to your nightly chores if you cook frequently. Empty the container at least once a week to avoid any kind of stench. Combine the kitchen scraps with carbon-rich materials for a balanced compost. Composting ingredients fall into two categories: nitrogen, or “green” materials and carbon, or “brown” materials. Despite the actual color of kitchen scraps, this is considered a “green” material due to the high nitrogen content. Balance this with an abundance of “brown” ingredients, such as leaves, wood and straw. While cardboard and paper products from your kitchen can be composted, keep plastics, glass and metal out of the mix. Sort these for recycling instead.